The fact of veneration implies learning and the aspiration to emulate. Why, say, venerate the soldiers of past centuries if not out of the desire to emulate their bravery and self-sacrifice? The very aspiration to practice certain virtues turns people into unwitting admirers of those who have succeeded where they still have desire alone. When the desire for self-improvement perishes, so too does the veneration of those who have attained it. Thus, a cowardly people will renounce the bravery of its ancestors and venerate only those who sew comfortable jackets. With regard to the veneration of the Mother of God, what kind of emulation do we have in mind? Emulation of the most manifold variety: of a quiet life, filled from within by great events; of virginity, worthily preserved; and of Motherhood, self-sacrificing in the highest degree. The way she followed her Son teaches us to keep all His saying in our hearts (cf. Luke 2:51). The way she stood beneath the Cross transcends human words in terms of pain undergone and of self-surrender into the hands of God. But all of this came later. 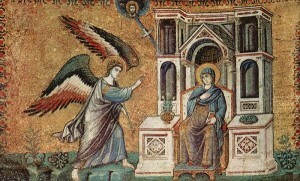 First there was the Annunciation. 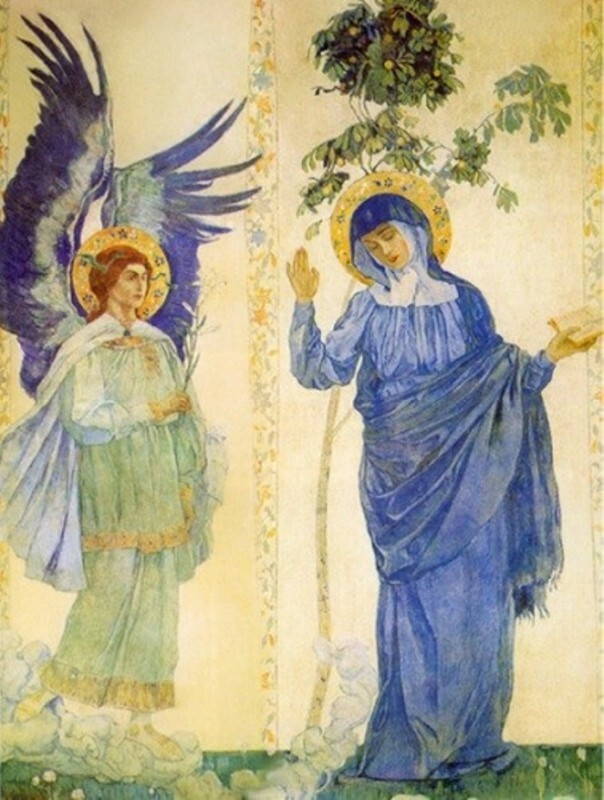 It is known that the Angel entered into conversation with Mary by God’s command, and that this was done in waking. This means that Mary was loftier in spirit than the Righteous Joseph, with whom the Angel communicated often. 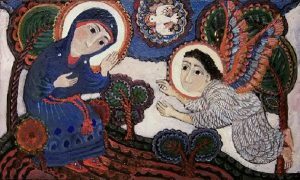 The Angel commanded Joseph to take Mary, his betrothed, without confusion; later, to flee to Egypt; and then to return to the land of Israel. But all these appearances and conversations occurred only in dreams, when the sensations of the body stand motionless, while the soul enters a region more akin to it than during wakefulness. Mary, however, lived when waking more in the spirit than in the flesh, for which reason she did not need to go to sleep in order to hear the voice of her heavenly visitor. The Angel had appeared six months earlier to Zacharias, the Forerunner’s father. This elder, who had spent his entire live serving in the Temple, was troubled, and fear fell upon him (Luke 1:12). Mary was also troubled, but without fear. She silently encountered the one who came, reflecting about what this visit might mean. Is it not clear from this that Mary possessed a certain spiritual experience and inner ascesis – and, as subsequently became clear, a considerable one at that? To converse with the Angel without fear; to enter into conversation not immediately, like the reckless Eve, but to reason within herself and use her inner ear – is this not the very thing to which all ascetic strugglers aspire? Yes. These are signs of the spiritual maturity to which courageous and attentive Christians aspire. Mary is their Commandress in ascetic struggle. It is no wonder that the Church calls the Theotokos the “sweet converser of those who keep silence,” “depth undiscernible even for the eyes of angels,” and so on. All this is so. Mary’s soul is deeper than the ocean and purer than children’s tears. Otherwise the Incarnation would not have been accomplished. It is said: For into a malicious soul wisdom shall not enter; nor dwell in the body that is subject unto sin (Wisdom of Solomon 1:4). All the more so, the hypostatic Wisdom of the Father would not have dwelt in any womb other than the purest and humblest. The glory of the Mother of God is spoken of prophetically in this psalm: All the glory of the daughter of the King is within (Psalm 44:14). These words are taken from the same psalm from which the Church takes its Theotokion prokeimenon: Hearken, O daughter, and see, and incline thine ear (Psalm 44:10). Speaking of the glory that is “within,” Scripture has in mind the purity of thought, quietness of mind, and lowliness of heart that are not visible to outside eyes, but which are visible to God, Who sees all. Thus, the Virgin is immaculate outwardly, but even more pure and magnificent inwardly. Her inner worthiness allowed God to choose the Virgin for the supreme ministry: not for the guarding of material holy things, but for the Incarnation of the Beloved and Only-Begotten Son. We venerate and celebrate all of this. But, when we began these words by God’s mercy, we stated that veneration leads to emulation. The absence of learning and emulation either destroys veneration, or else turns it into something that is superficial and hypocritical. In an effort to move away from both of these extremes, let us say that he who worthily venerates the Annunciation should strive to appreciate the value of silence – not only of the mouth, but at times of the mind as well. He who worthily venerates the Annunciation should at times immerse himself in the reading of the word of God, concentrating on what is being read, as the blessed among women was accustomed to do. One of the goals of the person who venerates the Mother of God should be to strive for a life that is quiet and removed from vanity, but inwardly rich and profound. 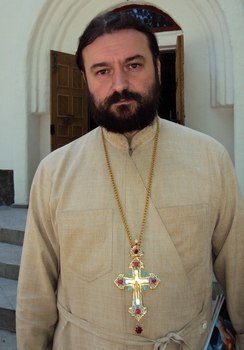 I think that, in this case, there are neither monks, nor laypeople, but only Christians, only children of the Apostolic Church. A large proportion of our suffering and languor comes from nothing other than our habit of scattered-mindedness, vain bustle, and constant inner noise.